Super EASY and delicious! This is a great lunch or dinner option, whether you eat it all, are a vegetarian or plant based! 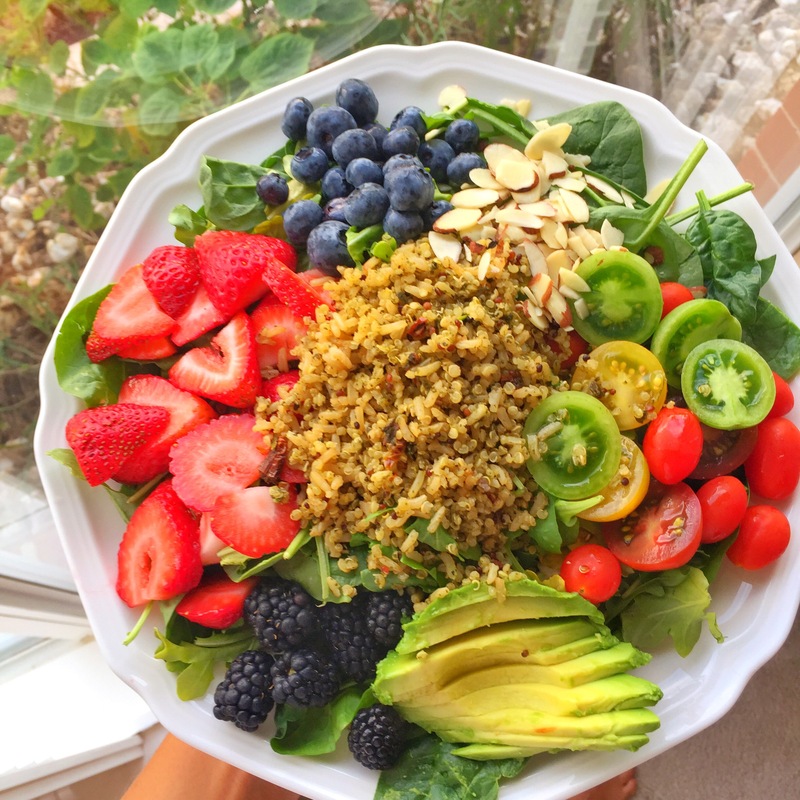 Count colors, not calories guys: eat the rainbow to get all nutrition your body needs. This is a balanced salad, plenty of carbs from the fruits and veggies, protein from the quinoa and fat from the nuts! I hope you all enjoy this! Balsamic vinegar drizzle, or the most awesome dressing ever (recipe below). This dressing goes perfectly week with these ingredients as they are sweet, so you’ll find the balance refreshing! SNAPCHAT: AnaSandee – I will continue to snap and cook so get the recipes in real time before they make it to the blog! Of course I’ll also be sharing some more awesome things about the pregnancy as I learn them! Videos stay up for 24 hours. I may condense them into YouTube videos after! 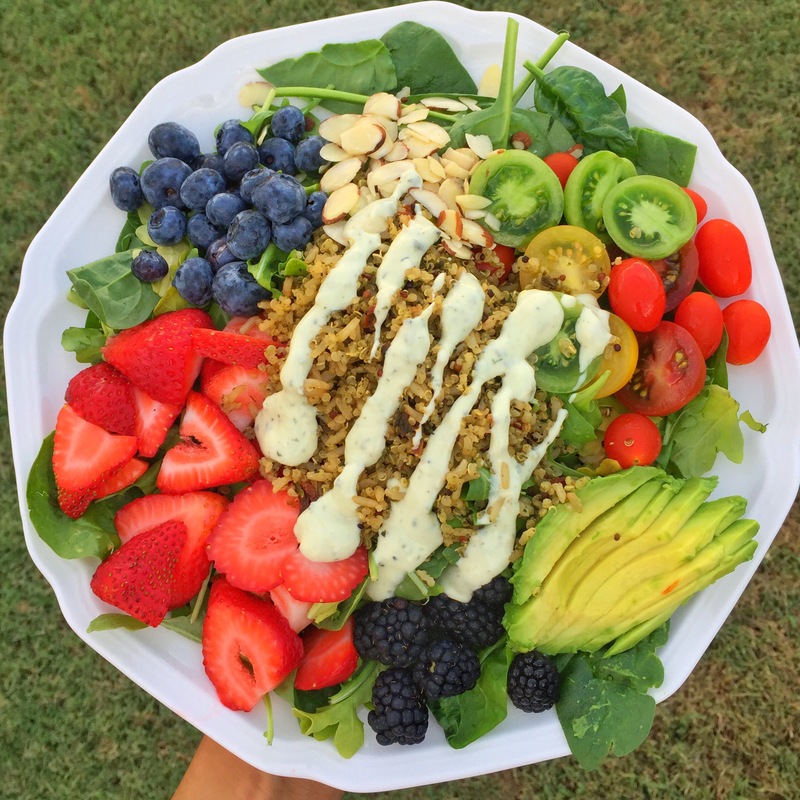 This entry was posted in Colorful Salads, Dine with me, Uncategorized and tagged cilantro yogurt dressing, healthy salad dressing, yogurt cilantro dressing. We love the cilantro yogurt dressing!! Just added to my favorite salad with some fresh cod. So refreshing and full of flavor! Totally win with this one!!! Thank you Colorful Foodie ????????? Good ? can’t go wrong with this one ? I can’t wait to try this dressing! I’ve used you Tortilla Soup recipes before and it was delicious!! !